Ningbo lies in the Province of Zhejiang, some 150 km south of Shanghai. Lying on the southern fringes of the Yangtze Delta, Ningbo has been a trading centre for two thousand years and is considered a main centre of Buddhism in China. Located one hour from Hangzhou and two hours from Shanghai by CHR, the city forms the southern boundary of the ‘Shanghai City Cluster’ – home to 6 metro systems (Shanghai, Wuxi, Suzhou, Nanjing, Hangzhou, Ningbo) and 60 million souls! 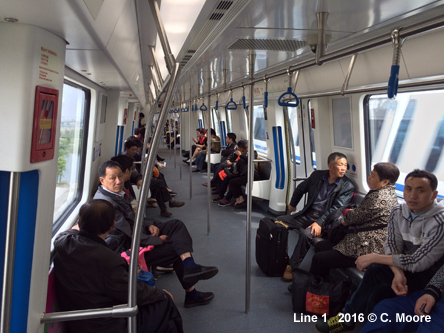 Ningbo is a relative newcomer to urban rail provision and currently has a two-line system operated as Ningbo Rail Transit. 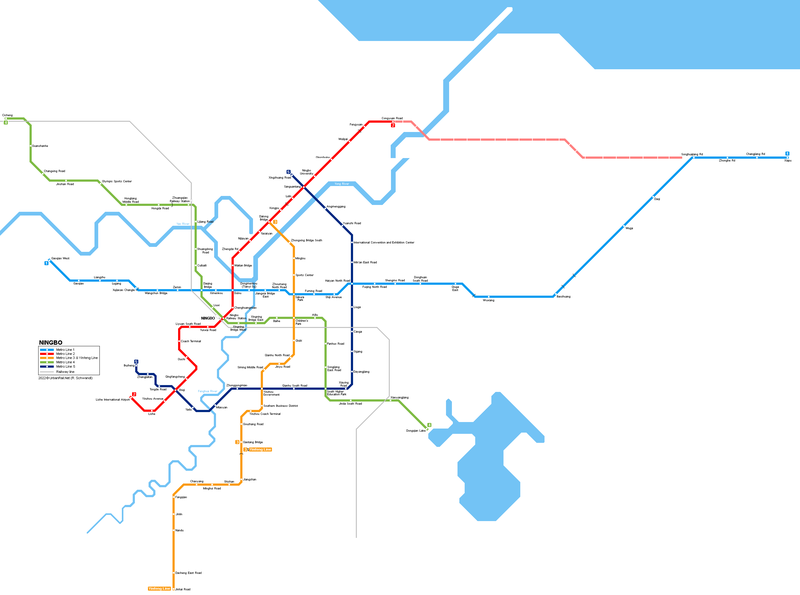 The lines cover 74.6km and have 50 stations. 42.1km of the system is underground. 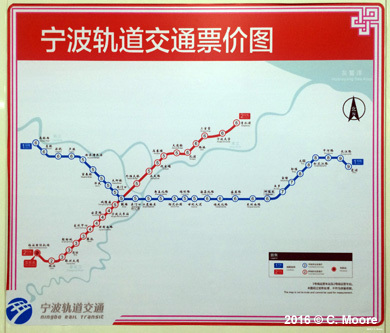 Line 1 runs west-east from Gaoqiao West to Xiapu for 46.2km. This line has island stations in the west and on the underground sections but the new extension in the east has a mix of side and island platforms. 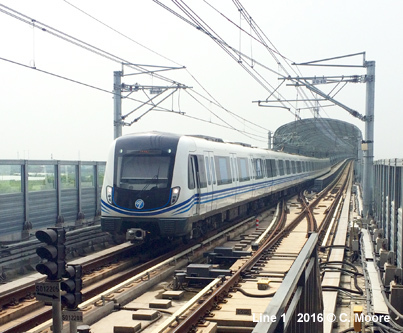 From Gaoqiao the line is elevated until the train leaves Xujiacao Changle. From here it runs through the city centre on an east-west trajectory, under the Fengua River and the centre of Jiandong before rising to very high elevated running after Quiga. This part of the line has lower passenger numbers and has quite a rural feel with much greenery, paddies being worked by locals, and hills spanning the whole horizon. The central stations have smart entrances with totem which lead to standardised station hall. 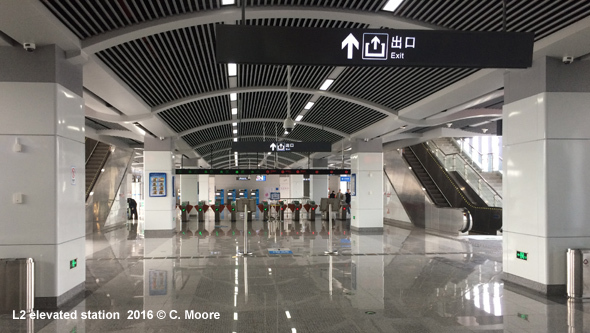 Ticket machines, security machines, customer office and ticket barriers are present, but there is a clean and bright feel to these halls. The main stations also have wonderful murals with historic themes. Navigation aids and signage are good, station information boards have a geographic map (quite poor) and local station location map. The platform areas have clean white tiling with station names in beautifully styled silver calligraphy, as well as English. 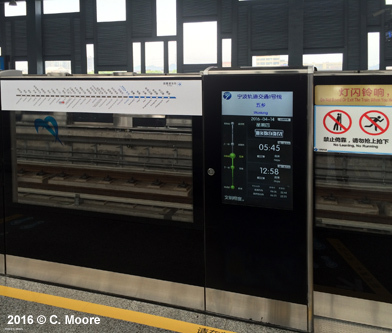 The full platform screens have a strip map above and there are next train indicators. 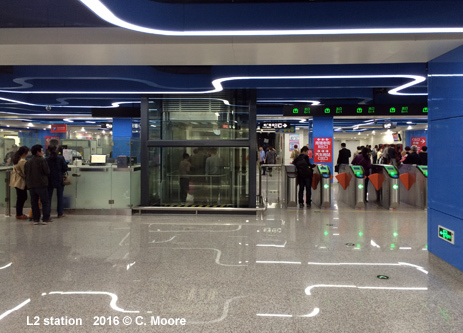 The elevated stations are quite large affairs, again smart and tidy, but with half screens. These have sections between the doors that house smart panels offering RTI and other information (see photo). Really very smart and the first time I had seen such a thing. 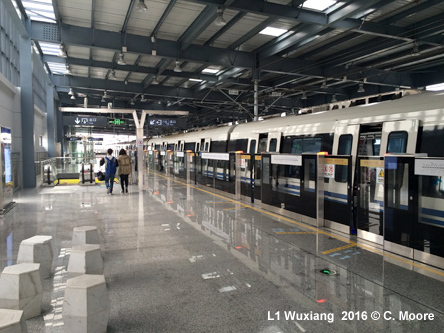 Interchange with Line 2 is at huge Gulou. Interchange is easy and speedy here but it is worth spending time looking at the design of the station interior, the lovely art work and the way passenger flows have been managed and operationalised. 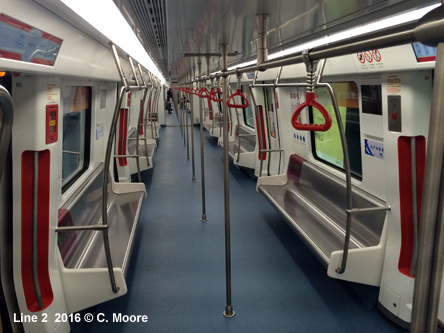 Very nice - and a good introduction to Line 2, which began operations in September 2015 and has a ‘brand new’ feel. The stations are pristine, the stock is gleaming and it even smells new. 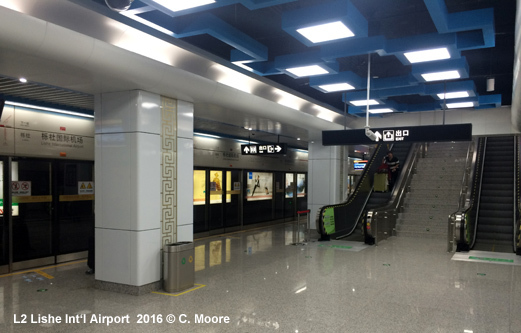 The 28.4km line runs from the southwest at the airport, passing through the huge Ningbo Railway Station and the western part of the city centre. The line runs under the mighty Yong to the interesting area of Datong Bridge to the northeastern suburbs around Ningbo University. This part of the line is elevated beyond Kongpu. The underground station entrances on Line 2 are of a uniform style with angular steel and glass construction. The ticket halls are bright and clean with rows of very modern and impressive burgundy coloured ticket machines, security operations, customer service centre and a single schematic map used as a fare information tool. 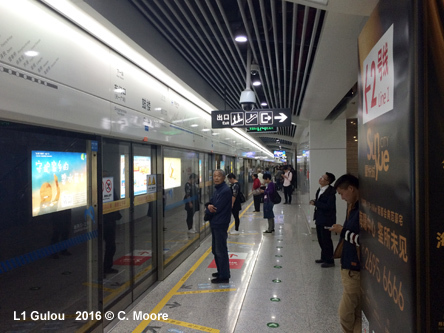 Like Line 1, the system is well signed and the underground stations have island platforms with seating, full platform screens, TV ‘next train’ information, strip maps and the smart calligraphic station names. Audio and electronic information is provided in Mandarin and English (Queen’s English rather than American). 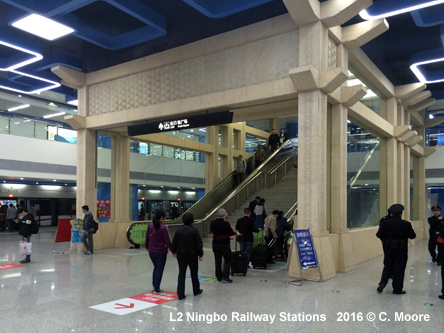 The stations along this line are very modern with a pale grey hue and traditional Chinese patterns embedded in the pillars (photos). The colour-coding of the line is done very subtly so as not to spoil the coolness and slickness of the stations. The elevated stations on this line have a rust coloured theme, but again it is not overpowering. 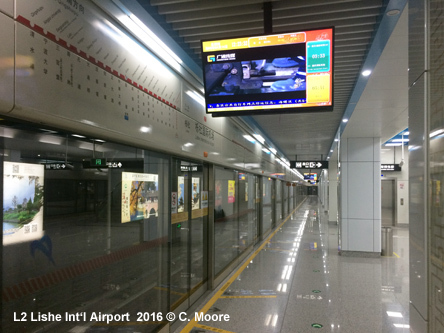 These stations are again smart and clean and have half-screens and platforms have the full complement of information. As a note of interest - one normally expects an ‘airport station’ to be located in or adjacent to the terminal. However, the LIA station is accessed by shuttle bus. This shuttle runs every 9mins from outside the terminal building. 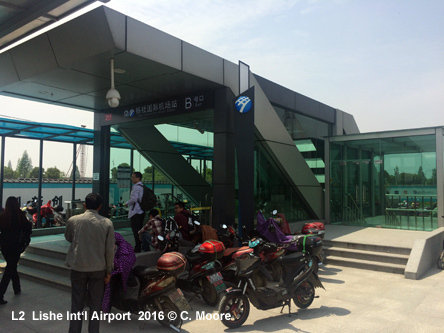 Arriving in Ningbo by flight and being new to the system I duly waited for the next bus. This was packed to the rafters with people and suitcases. Once we pulled away from the stop and cleared the terminal building, the metro station entrance was in full view – the bus ride takes 2 mins! It would have been much more expedient to walk. As for the service provision, both lines use 6-car CSR through sets, each carriage containing 8 doors. The trains run on 1435mm rails and are powered through overhead supply. The strip maps on Line 1 stock have the usual light indicators for train progression whilst Line 2 cars have an interactive, smart strip map above the doors (see photo below) which is most impressive. Apart from the strip maps, train interiors are similar, bright clean and with side seating, minimal advertising and no schematic maps - the only difference is the long vertical handles at the sides of the doors have different encasements (Blue for line 1 and Red for line 2). These are very nice touch and add to the smartness of the interiors. On-train audio and electronic information is provided in Mandarin and English. As for the exterior, both lines’ stock have black frontages but line 1 trains are white with a blue side strip whilst Line 2 trains are white with red side lines. 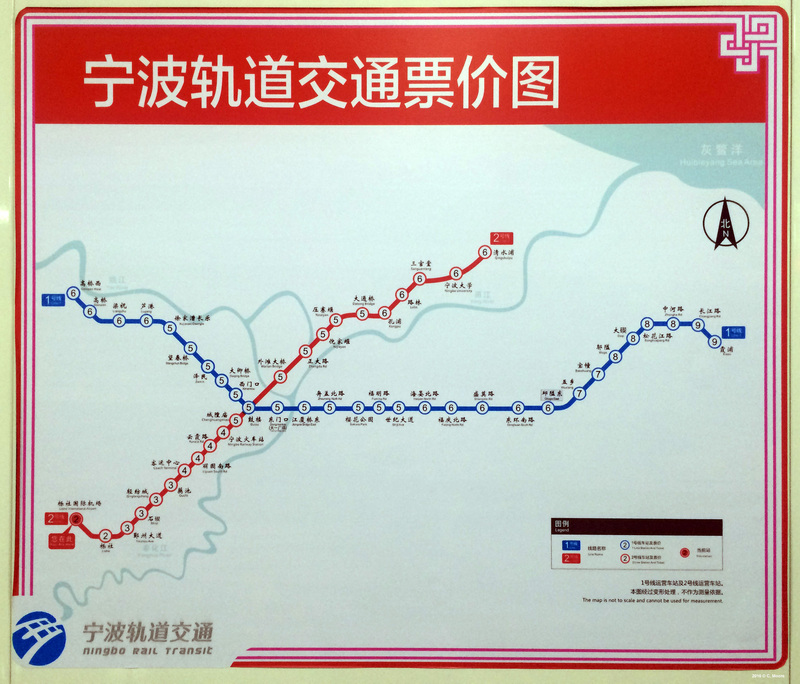 Services operate from 0600-2200 with a 7min base headway and fares are distance-based (2-9 Yuan). The tickets are in the form of a card which is tapped on entry and slotted on exit. There is a small schematic in stations but this is used to indicate fare levels. There is, however, a supply of map and system information in hard copy available at most stations. Whilst this is in Chinese only, it is a welcome sight as, from its peak in 2013/14, there seems to be a decline in information provision on Chinese metros. A nice note to end on! 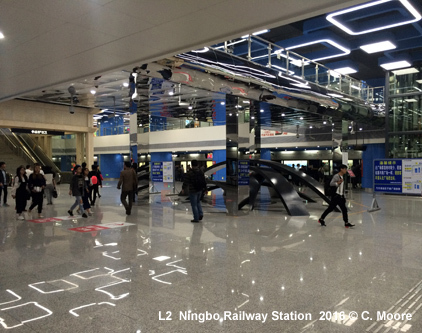 Ningbo is a good example of the latest generation of metro lines being built and operated in China. It’s safe to say that the formulaic template which served the country well with the rapid expansions of recent years have given way to more nuanced approaches. Yes, there are some uniformities but in terms of style and added quality, there has been a bit of a step change I feel. A very impressive system – especially Line 2.